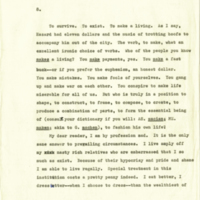 Typescript from the third draft of Robert Kroetsch's 1969 novel The Studhorse Man. Kroetsch, Robert. The Studhorse Man. To survive. To exist. To make a living. As I say, Hazard had eleven dollars and the music of trotting hoofs to accompany him out of the city. The verb, to make, what an excellent ironic choice of verbs. Who of the people you know makes a living? You make payments, yes. You make a fast buck--or if you prefer the euphemism, an honest dollar. You make mistakes. You make fools of yourselves. You gang up and make war on each other. You conspire to make life miserable for all of us. But who is truly in a position to shape, to construct, to frame, to compose, to create, to produce a combination of parts, to form the essential being of (consul your dictionary if you will: AS. macian; ME. maken; akin to G. machen), to fashion his own life? 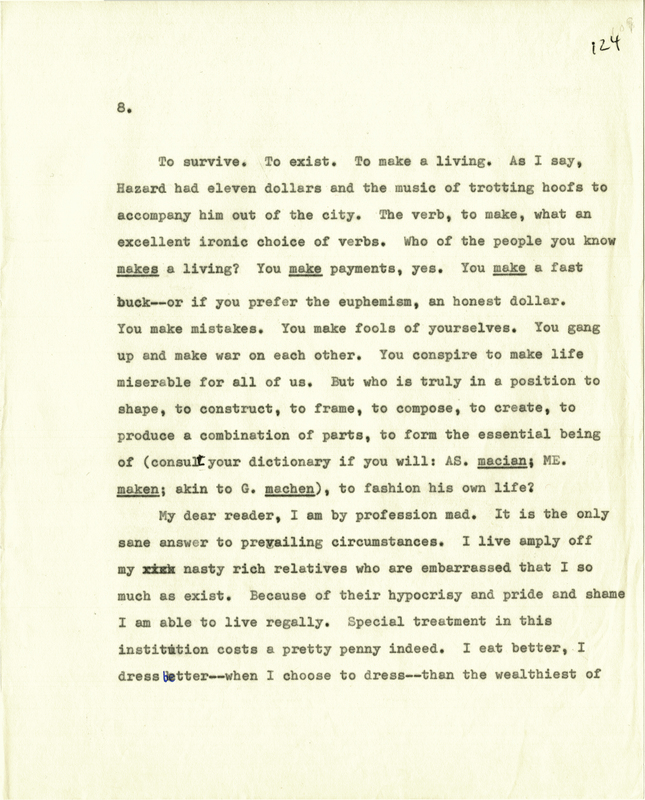 Kroetsch, Robert, 1927-2011, “Typescript draft of The Studhorse Man, page 124,” University of Calgary Class Projects, accessed April 18, 2019, https://omeka.ucalgary.ca/document/324.